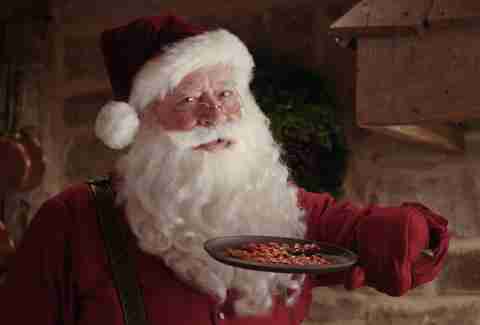 While it's nice that you leave out a plate of cookies for the old dude who breaks into your house via chimney every year, he really thinks you could do better. Nothing against your Mom's gingersnap recipe -- it's just, are those bacon? We think not. Kris Kringle would prefer you cook him up some pork instead this season, and he's willing to donate to charity to make it happen. Put together by the Farmland Bacon Club, this spot shows an extra-creepy Santa making his pitch for a new midnight snack. He'll take classic-cut, thick-cut, hickory, applewood, double-smoked -- whatever you got. And he's not the only one who benefits. If you sign his "pledge", Farmland Bacon Club will donate to Feeding America, a massive network of food banks that provides meals for more than 46 million people. That's a pretty great win-win, and we know you still have bacon left over from your last price panic, so consider saving a few strips for St. Nick this December 25th. Kristin Hunt is a Food/Drink staff writer for Thrillist, and will gladly eat those cookies if Santa doesn't want them. Follow her at @kristin_hunt.